Our program has been in existence since 1985. 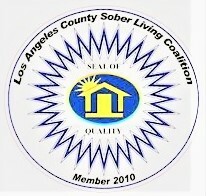 We are a member of Los Angeles County Sober Living Coalition. All staff house managers and staff assistants are recovering with substantial clean and sober time. The Director has over 38 years clean and sober. We work as close as possible with residents, therapists, sponsors and outpatient counselors. We provide referral programs for those in need of clothing, food and government funds. Approach in Addressing the Re-Entry Needs of the Residence We have a period of 60 days for new residents to document their outside activities. After this period it is decided by staffing. They have to use “activity roster.” All outside support groups are confirmed by signed documentation carried by residents and shown to staff. Residents are referred to agencies that specialize in referral services for our residents. We also have weekly 12-step meetings at all of our home. Approach to participants with co-occurring disorders. We are aware of what affect they have on other residents. The residents that are allowed to reside in the homes must be able to adhere to our rules and abstain from illicit drug or alcohol use. We must be able to confer with their outpatient programs, therapists, sponsors and recommended treatment modalities. We promote family participation and support for our women.